Exuding mid-century modern style, this elegantly designed dresser fits well in most modern bedroom settings. Made from durable wood with a gray finish while chrome trim highlighting add a spark of flash, accentuating the rigid angles and lines of the design. The dresser features eight drawers that provide you space to accommodate clothing or other items, and chrome bar handles let you pull them out with ease. The drawers are raised over bracket feet that complete the modern charm of this beautiful dresser. Use its spacious top to display flowers, photographs and other decors to create a stylish bedroom. Made up of durable wood and metal, features chrome trim details. 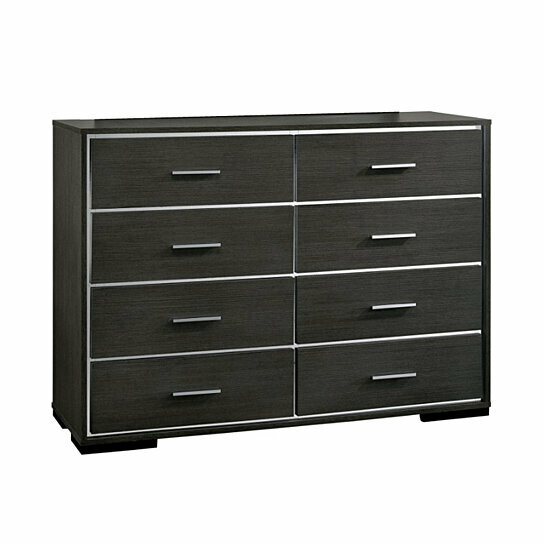 It features Eight spacious drawers with metal bar handles and accented by chrome trim detail. Can be use to store jewelries, clothes and other knickknacks while the smooth top can be used for decorative purposes.